A year ago, generous donors helped the community around Richard Spring in Western Kenya build a spring protection and sanitation platforms. Because of these gifts and contributions from our monthly donors, partners are able to visit project sites throughout the year, strengthening relationships with communities and evaluating the actual water project. These consistent visits allow us to learn vital lessons and hear amazing stories – we’re excited to share this one from our partners, Rose Sereti and Mary Afandi, with you. The community around Richard Spring has experienced incredible transformation since the local spring was protected to ensure clean water for the community. Lilian Achieng, a woman in the community who benefits from the water at Richard spring testifies to the improved health that she has seen. She proclaims, “I am happy to say that Richard Spring has not been the same since the project intervention last year. 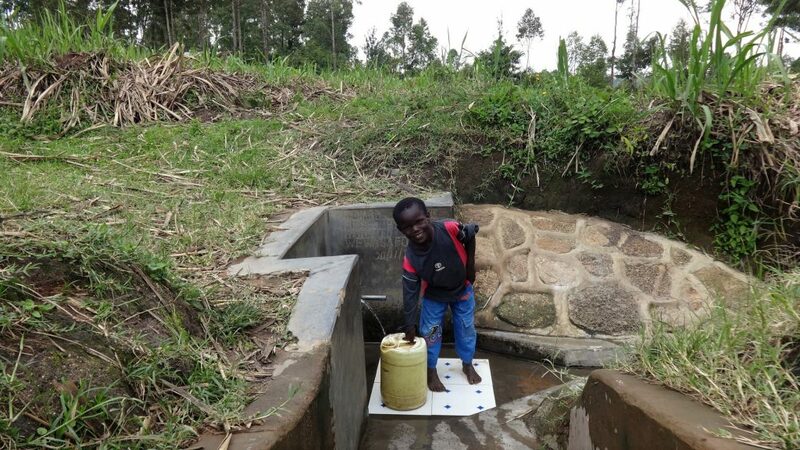 The protected spring has reduced the sickness and now the community has clean and safe water.” Yet, the improved health can only happen with improved hygiene and sanitation practices, and the community around Richard Spring has made some incredible improvements in this area. Rose and Mary report, “The community members living around Richard Spring are now very healthy and happy. The surrounding environment is clean. Initially there were complains of diseases outbreak like malaria, typhoid, diarrhoea and stomachache. 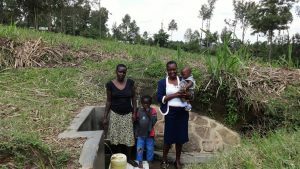 Nowadays they are happy because the money used for medical is being used for taking care of the family.” When the cases of sickness are reduced because of clean water and improved hygiene and sanitation practices, the people are freed to use both time and resources toward other personal and family goals. Barrack Okova, age 9, is enthusiastic about the impact that it has had on him and other children in the community. He shares, “I am happy because we have a lot of water for drinking, cooking and washing. In addition, we don’t take a lot of time to draw water because there are two pipes which discharge water.” Yet, Barack and other community members have noticed impact beyond just access to clean water- they see that the community is healthier because open defecation is no longer a problem since people have access to pit latrines. One protected spring unlocks the potential for many families! We are excited to stay in touch with this community and to report the impact for those drawing clean water from Richard Spring. When you invest in The Water Project, you're investing in people like Lilian Achieng. Your gifts help us reach more communities with the gift of clean, safe water. And every drop helps unlock potential.